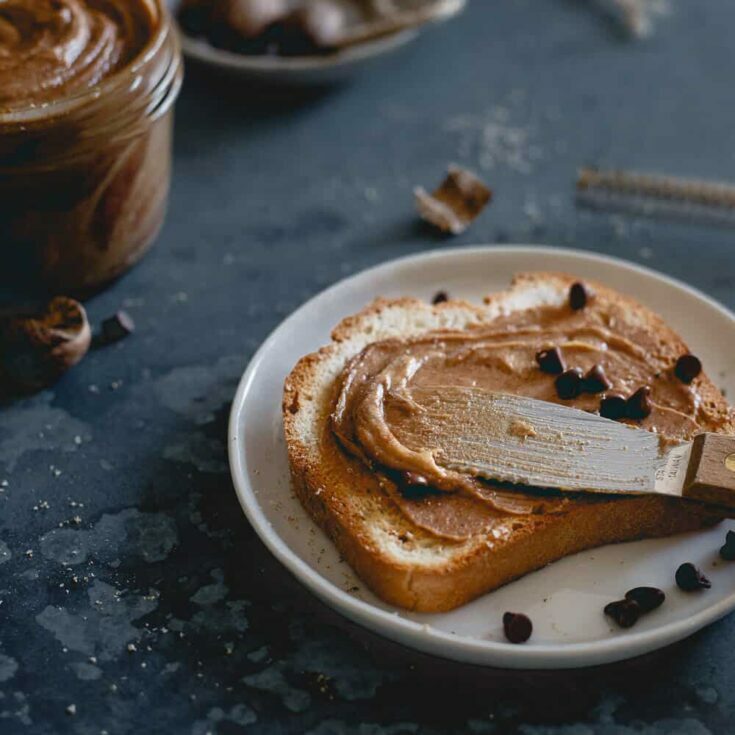 This creamy gingerbread peanut butter is made with molasses roasted peanuts, holiday spices and optional chocolate chips. 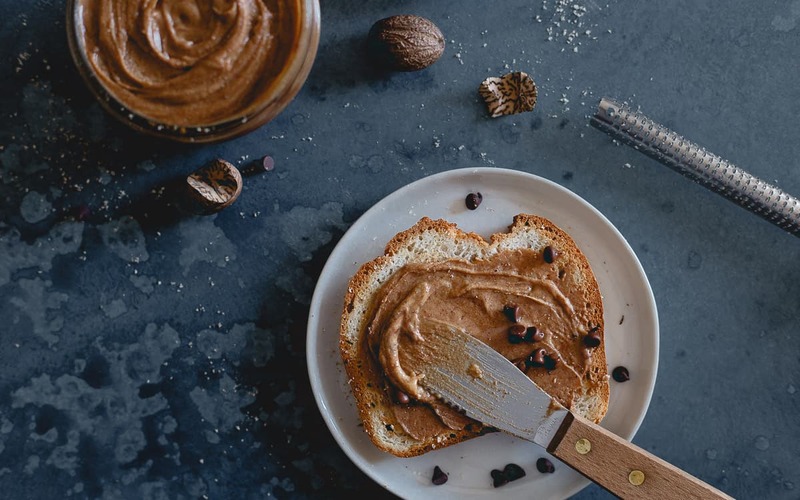 Enjoy it this holiday season on toast, dolloped in oatmeal or straight from the jar with a spoon! 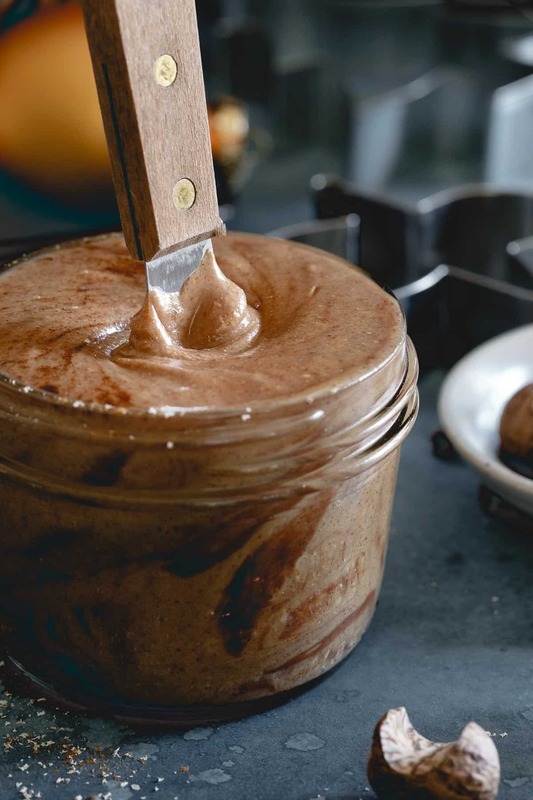 I forgot just how good homemade nut butter can be. I used to be super into it (as evidenced by this maple roasted vanilla almond cashew butter, this maple cinnamon almond butter, this roasted almond pecan pumpkin butter or, the many others back in the archives) but I guess I got lazy or just enthralled with all the amazing store bought ones out there these days and haven’t really made my own in quite some time. Then this gingerbread peanut butter popped into my head. 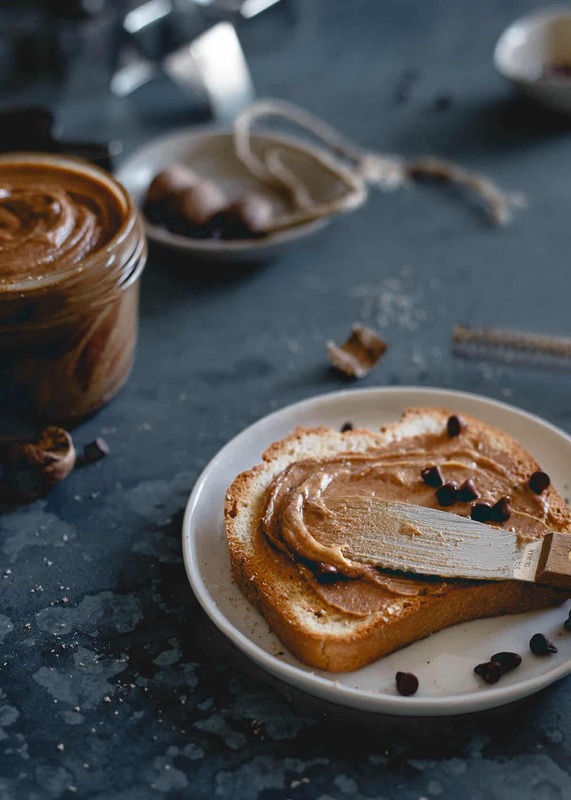 There are pretty much a million different flavor options out there when it comes to nut butter but weirdly, I have yet to see a gingerbread flavored store bought option! I’m honestly shocked Trader Joe’s hasn’t cornered the market with this yet considering how madly in love people fell with their cookie butter and then pumpkin cookie butter seasonal variety. It would only make sense to capitalize on the most classic Christmas baked good flavor profile out there too, no? Come on, TJ’s, you’re slacking. This gingerbread peanut butter is really a two in one for me. 1 – I’ve become madly obsessed with Udi’s bagels and bread. Madly. I don’t care as much about the gluten-free part as I do the taste and the fact that they’re pretty much the lowest carb options out there while actually still tasting good. I eat one or the other (or both) basically every day so the more spread options available to me, the better. 2. As previously discussed, gingerbread and nut butter just needed to be combined for the season. It only makes sense! I almost went the almond route but you know what, I feel like peanuts have taken a back seat in the world of nut butters lately and that’s a damn shame. 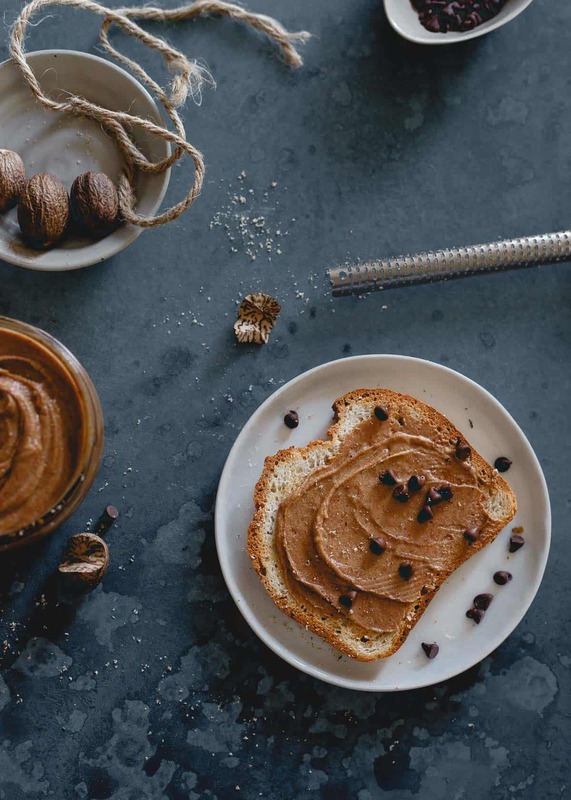 Shame on us for ignoring the original nut that started this whole nut butter obsession! I also enjoy how much cheaper they are than other nuts. Real life talk right there. My intention with the chocolate chips was for a fun little bit of crunch in the peanut butter but when I added them at the end, the heat from the food processor doing it’s magic for 10 minutes or so to make the gingerbread peanut butter so creamy actually ended up melting the chips and resulting in a slight chocolate swirl. It was one of those fortunate accidents because I think I love it even more this way. You get gingerbread spice, a slight sweetness and then a hint of chocolate in each bite. It’s kind of magical. So if you’re into the classic winter cookie, whether it’s in the form of hard gingerbread men or soft and chewy molasses gingerbread cookies, I can guarantee you’ll love this spread. This creamy gingerbread peanut butter is made with molasses roasted peanuts, holiday spices and optional chocolate chips. Enjoy it this holiday season! Preheat oven to 350 degrees. 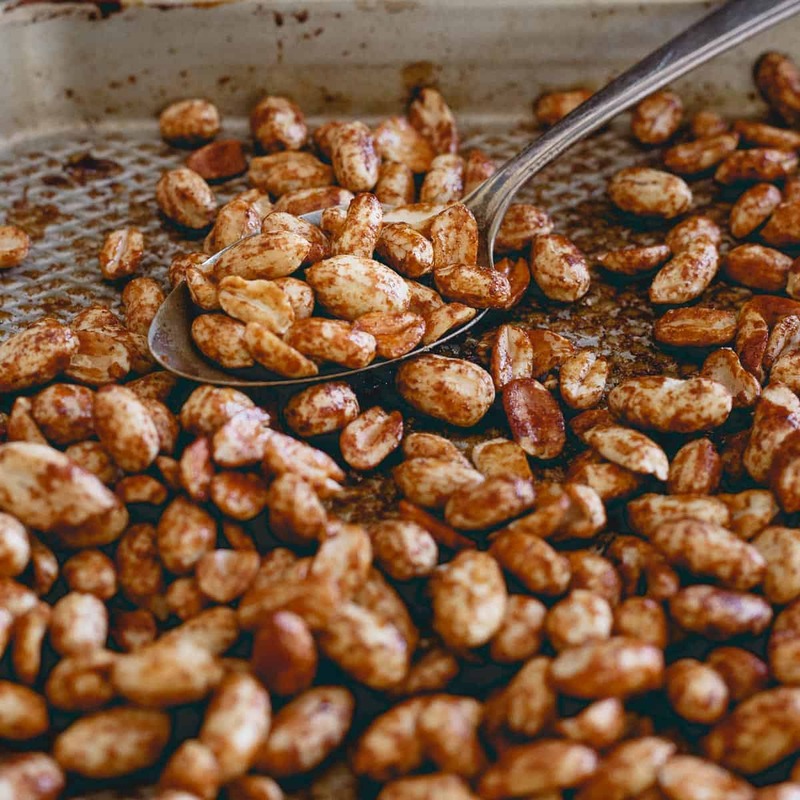 Toss peanuts with the molasses, cinnamon and coconut sugar. Bake for 15 minutes, tossing once half way through. Remove from oven and let cool for a few minutes. 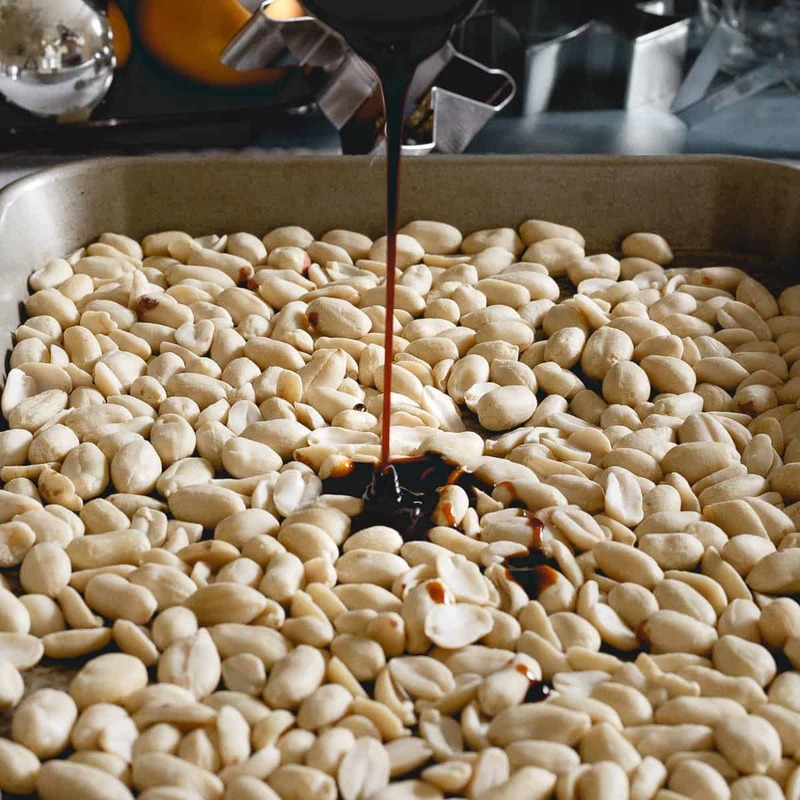 Add the roasted peanuts to a food processor and process for 1-2 minutes until flour-like consistency. Add the coconut oil and continue processing until smooth, scraping down sides as needed. This process will vary depending on your food processor but usually 5-10 minutes is standard. Once creamy, add the remaining ingredients (except chocolate chips if using) and process for another minute. If using, add the chocolate chips and pulse for a couple of seconds to combine with the peanut butter. The chocolate chips will melt from the heat created by the food processor creating a subtle chocolate swirl in the peanut butter. Transfer to a jar or storage container and keep refrigerated. What a great idea for the holidays Gina! I think I’d be slathering this over everything! This is freaking genius!!! LOVE this! I already know that this would be addicting! This. Is. Brilly. Girlfriend! I need to make this stat!!! Ok, this sounds amazing! 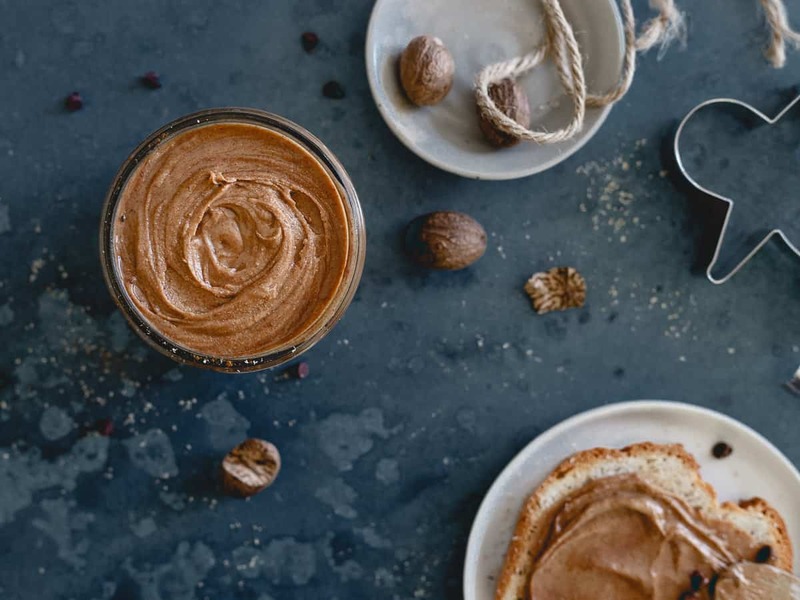 I can’t believe I’ve never made my own nut butter before, but I’m definitely going to have to start with this recipe! First of all, I’m probably WAY behind, but I’m lovin’ the new look here! Also, I need this peanut butter in my life! haha nope, less than a week old :) Thanks! This is a genius flavor combination! Just give me the jar and a spoon! Yes, please!! Oh, my gosh! I’d spread this on everything!! What a fun holiday spread!! Shut. Up. This sounds so good!! Possibly a silly question, but is it fresh ginger? Or maybe ginger powder? Also, for the roasted peanuts, is it salted or unsalted? Looking to make for Christmas gifts! ground ginger/ginger powder – the spice not fresh ginger root. I use unsalted peanuts and add salt to taste. Makes a great gift, enjoy!